Audio Mixer is an essential device in Audio Electronics. The mixer mixes two or more audio signals into a one (Mono) or two output (Stereo). The audio mixer uses audio mixing process where multiple sounds are combined to form a single or multi-sound. It is a widely used process in Live concerts, televisions, films, music industries etc. 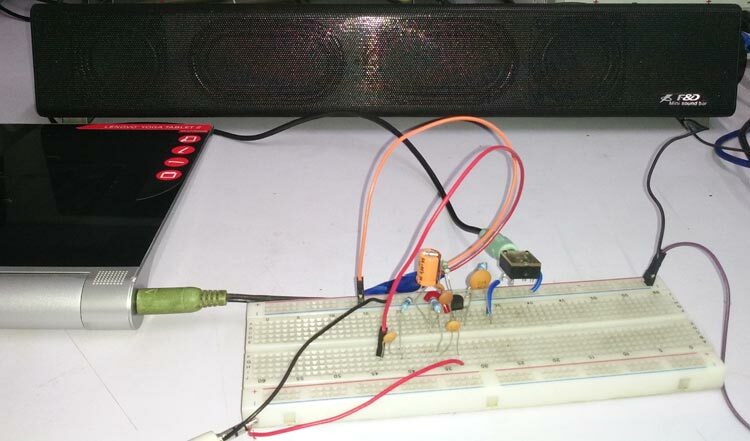 In this project, we will make Audio mixer using a single transistor which will combine two or more audio signals and produce a combined audio output. In this circuit, two audio inputs will be mixed using a single transistor to produce a mixed audio output. Separate Audio signals for mixing. Here PN2222A transistor is used. 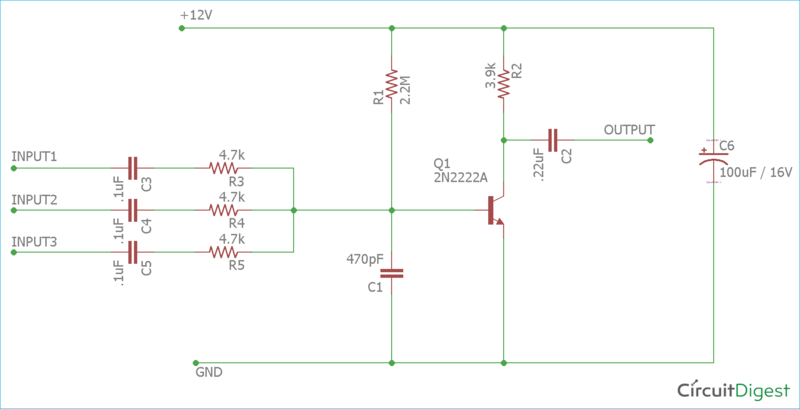 Different transistor with the same ratings can also be used with this circuit like 2N3904. Below is the pin diagram of a PN2222A transistor. PN2222A is an NPN Silicon transistor, widely used in general purpose electronics. This transistor has 500mA of collector current and can be used for medium power amplification purposes. The case style available is TO-9. In this Audio Mixer circuit, transistor 2N2222A is the heart of the circuit. The emitter is connected with GND and the collector is connected with a 3.9k resistor. The output is provided across a .22uF capacitor. The other components are connected across the base of the transistor. Inputs are provided through .1uF capacitor and 4.7k resistors. We are powering the circuit using a 12V DC power supply unit. Here the transistor is amplifying three inputs which are available across the collector. The input capacitors are blocking any DC signal coming from the signal source and only allowing the AC to pass. Limiting resistors 4.7k R3, R4, and R5 are essential to mix three signals perfectly. For biasing the PN2222A transistor 2.2M resistor is used along with 470pF ceramic capacitor. Resistor R2 (3.9k) is used to provide the necessary collector current required for amplification purpose, and the output ceramic capacitor of .22uF is used to block the DC and only allowing amplified AC signal. 100uF, 16V Electrolytic capacitor is added for smooth DC supply and decoupling. We can listen mixed audio signal directly if we connect low power headphone across the .22uF capacitor. For additional amplification, other external amplifiers can be connected across the circuit. Check here various Audio Amplifier Circuits. To test the circuit we used an Audio amplifier and connected it across the output. Although the circuit has option for three input channels, but here only two individual signals are provided. We gathered every component and made it on the breadboard like in the image shown below. We provided two input signals, one from the laptop and another one from the Android tablet. Then the two signals are mixed by the circuit and amplified at the output. In the below images, we can see that the two inputs are connected using a 3.5mm audio jack and mixed together. We added a 3.5mm socket on the breadboard to connect an Audio Amplifier sound Bar. Whole circuit is powered by the Bench power supply with 12V. You can check the working of Audio Mixer Circuit in the Video given below. The circuit is working really well and there is no audible noise. We can also add multiple outputs to the circuit. Circuit can be made on PCB or on small Vero-board to minimize the noise. Additional buffers and filters can be added in both the input channels as well as in the output. If we connect individual potentiometer in each channel we can control the volume of each audio signal. This is how two or more sounds can be mixed easily with a very simple circuit. To learn more about Audio related circuit, just follow the link.